Everyone knows it’s hip to be green, and Finland is doing its part in a typically wacky way. 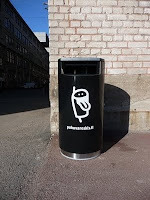 Last summer, four talking trash bins in the center of Helsinki encouraged passersby to throw trash away while teaching them the Finnish language. This summer, the bins have returned in full chorus with four new buddies, now in locations near Esplanadi, Senate Square, Sibelius Monument and Temppeliaukio Church. Simo Frangén, a popular Finnish TV celebrity, is the voice behind the taking trash bin which speak in 6 languages (Finnish, Swedish, Japanese, English, German, Polish, and Russian). Some even provide a musical accompaniment to the dialogue, with sounds created by Helsinki high school students. Think this is wacky? Finland is also home to wife carrying contests, mobile phone throwing competitions, sauna sitting marathons, mosquito swatting events and other equally crazy events. Who would have thought!